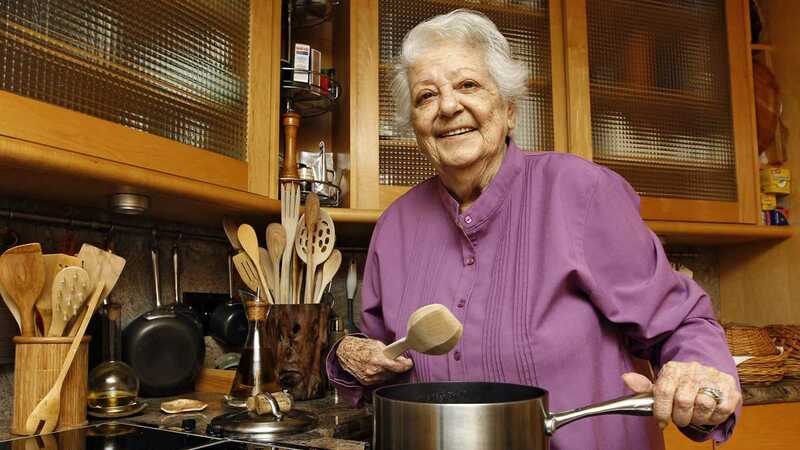 Like so many other cooks in America, my life was changed by Marcella Hazan, who died Sunday at the ripe age of 89. She had the good fortune to pass away peacefully at home at the side of Victor, her beloved husband of more than 50 years. Marcella was the mother of real Italian cooking in America. Just as Julia Child introduced Americans to authentic French cooking, so Marcella did the same for the cooking of her homeland. Born in Italy in 1924, Marcella followed her American husband to the States where she found herself in an incomprehensible food world. Used to seasonal vegetables, fresh from the garden or farmers market, she found instead the old, sometimes wilted abundance of the American supermarket, divorced from season and place. Used to a live or freshly butchered chicken, in America she found them days old, cut up, and wrapped in plastic, “like a coffin,” as she once said. As hard as it is to imagine, in the 1950s and indeed much later, one couldn’t easily find extra virgin olive oil in America. One couldn’t find parmigiano-reggiano. One couldn’t shop at farmer’s markets. And one certainly couldn’t find a chicken raised on pasture. Soon followed cooking classes, taught in her small New York apartment, and then lunch with food writer Craig Clairborne, and then her first cookbook and fame. The Hazans were able to return to Italy to live, first in Bologna, and later in a historic 16th century restored palazzo in Venice, where Marcella continued to teach classes. She continued to write cookbooks as well, with her 1997 book Marcella Cucina the most beautiful and personal of her many excellent books. For me, though, it was Essentials of Classic Italian Cooking, which introduced me to Marcella Hazan and transformed my life. Working on farms in the late 90s, I found myself with access to produce of the highest quality for the first time in my life. Wanting to cook these vegetables in a way which honored their integrity, I found in Marcella a teacher whose approach to cooking resonated deeply with my own instincts: emphasize the ingredients themselves and not the chef; keep preparations simple; don’t be afraid of salt. The first pasta sauce I cooked was her recipe for a tomato sauce with onion and butter. I was completed unprepared for and amazed by the way the butter transformed the flavor of tomatoes, and I was immediately hooked. Many recipes followed. The first dish I ever cooked for my wife was a vegetable stew with potatoes, tomatoes, and peppers from Marcella. I later converted my wife back from vegetarianism by preparing Marcella’s ragu Bolognese. Just last weekend at the restaurant I fried piadina bread filled with ricotta, another recipe from her book. The list goes on and on. Night after night during college and later as a bachelor and newlywed, I cooked recipes from her books, honing my skills in the kitchen. Although I eventually broadened my knowledge by studying other authors and trusting my own instincts, Marcella’s books have always been and still are at the heart of my own cooking for my family and for the restaurant. Above our mantelpiece in the restaurant is a quote from Marcella which expresses how we feel about her and her approach to Italian cooking. Making time to eat as the Italians still do is to share in their inexhaustible gift for making art out of life. A few days before her death, I had felt an instinct to write to Marcella to express thanks for all she had given to me. Although she will now never read it, it feels good to have expressed in written form something of what her work has meant to me and countless others.